We are a leading Manufacturer of impact pulverizer from Salem, India. The "SFC" impact pulverizer meets most capacity requirements. It lends themselves to a wide degree of adjustment with finesse of the finished products ranging from about 60 mesh to bulk passing through 300 B.S.S. Meshes depending to a considerable extent on the particular materials being handled. The impact pulverizer / pulveriser is a versatile grinding unit of heavy and rugged construction and built for continuous operation day after day. The impact pulverisers are especially designed for the medium fine, and fine size reduction. The impact pulverisers meet most capacity requirements and lend themselves to a wide degree of adjustments with fineness of the finished product ranging from about 60 mesh to bulk passing through 300 mesh, depending on a considerable extent to the particular material being handled. Unlike an ordinary hammer mill, it has no screens to break, wear out or clog in the crushing chamber. The techno wings impact pulverisers are combines grinding, classifying and conveying all in one single unit. The impact pulverizer consists of an encased rotor carrying swing hammers, whizzer classifier for fineness regulation and pressure gradient creator mounted on a solid shaft. Raw material to be pulverized enters the crushing chamber through the hopper or the automatic rotary feeder. The impact of the hammers on the feed material against the liner plates reduces it into fine powder. The ground material is carried towards the whizzer classifier for classification and the oversize particles are rejected by the classifier and returned to the crushing chamber for further grinding. The classified material is then conveyed into the cyclone for collection and bagging. 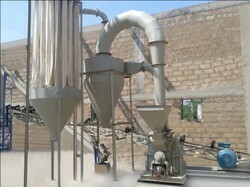 A dust collector is provided in the system for ensuring dust less operation and for no loss of ground powder.